By Tianna DuPont, WSU Extension. April 4, 2019. As Fire Blight season approaches make sure you have your fire blight plan in place. Most products work best when applied within the 12-24 hour window before a wetting event so a good plan is critical to timely execution. Know your high-risk areas, calibrate your sprayers, have products on hand, and be agile to change plans when mother nature and thinning change the reality for you. 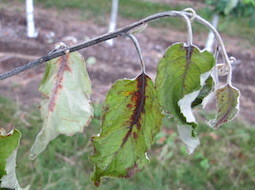 Check out our newly updated Fire Blight Page for ideas on improving your programs. Any time there are blooms on the tree there is risk of fire blight. Watch the model. Conventional Management: Watch the model. After a period of warm weather, best results are obtained when antibiotics are applied within the 24-hour window before flower wetting during a high infection risk period. Products used must contact the interior of the flowers in sufficient water and approved wetting agent to completely cover the interior. Repeated antibiotic sprays may be necessary during extended high or extreme risk periods. One pound of any 17% oxytetracycline product per 100 gallons gives a 200-ppm solution. Kasugamycin is another effective antibiotic. Some trials have shown that a full rate of Kasugamycin and a full rate of oxytetracycline provides excellent control. Applications of less than 100 gal/A can be effective on small trees if flower interiors are well covered, but do not drop the ppm below 200 (oxytetracycline). Application by ground equipment on each row is highly recommended (aircraft is NOT recommended). Many fire blight bacteria in the Pacific Northwest are resistant to streptomycin, another registered antibiotic. Consider mixes and adding systemic acquired resistance products to improve your programs. Consider adding a biological (e.g. blossom protect) during early bloom in high pressure blocks to provide protection in case of un-anticipated infection events. Organic Management. Early bloom. Lime sulfur plus oil (apples only). One to two applications of biologicals (Blossom Protect). Reapply biological after lime sulfur, which is antimicrobial. Note lime sulfur alone while suppressive to bacteria does not provide sufficient control in high pressure events. Blossom protect needs twelve or more hours to grow inside the flower to provide protection. If a wetting event is imminent switch to copper/bacillus products. Full bloom to petal fall. Depending on the cultivar russet risk and the CougarBlight model risk follow with Bacillus subtilis (Serenade Opti) (most fruit safe) every 2-5 days during flower/petal fall or copper hydroxide/octanoate (e.g. Cueva, Previsto) every 2 to 6 days (less fruit safe for russet). Coppers have had higher efficacy than biologicals during bloom in Washington trials. Do not follow coppers with any products with acidifiers. Good drying conditions are important to avoid russet risk. Petal fall to two weeks after. Continue protective programs one to two weeks post petal fall. Warm conditions during late bloom increase fire blight risk for late blooms still present. WSU Newsletter article April 10, 2017.